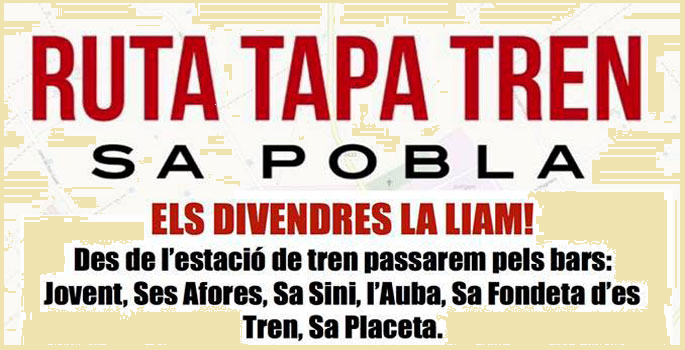 Every Friday of the months of March, April and May, Sa Pobla invites you to get on the Tapa Tren Route, with stops at different bars in the town where you can enjoy concerts, tapas and a lot of surprises. The route starts at the Sa Pobla Train Station and from there you can go through the Jovent Bar, Ses Afores, Sa Sini, Auba, Sa Fondeta d'es Tren and Sa Placeta. Get on the train and enjoy Sa Pobla!